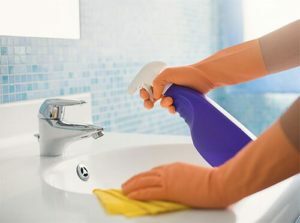 Of all the cleaning jobs in your facility, you’ll have trouble finding anybody eagerly raising their hand, jumping up and down, and volunteering to clean the bathroom. Nobody likes to clean the bathroom but it is something that has to be done. It takes the right frame of mind to get in there and give it the good clean needed to leave it spotless. But does anybody really know how to clean the bathroom properly. The bathroom is covered with bacteria. Quick! Which part of the bathroom contains the most bacteria? If you guessed the toilet, you would actually be wrong. The sink is absolutely covered with bacteria along with several other contact areas. Simply scrubbing the toilet is not an adequate cleaning process. 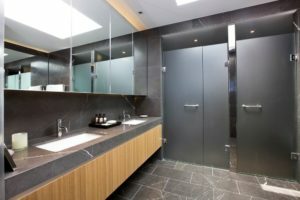 Few realize truly how dirty the bathroom is and what kind of time and supplies do you need to clean the bathroom well. 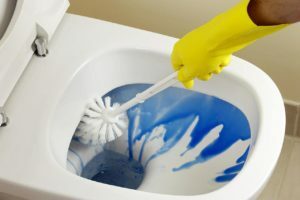 This page will review a 4 Step Process that will include some tips, suggestions, and challenges when it comes to cleaning and maintaining a clean bathroom. Before you start cleaning, go in with a plan. As painful as this process is, don’t spend more time in there than you need to. Also, avoid wasting your time using inadequate tools and products. As you read this page, refer back to the Supplies Page at Bortek for restroom disinfectant, floor cleaners, and all-purpose cleaners. Get the good stuff that isn’t going to waste your time because of quality issues. Select items that you need; nothing more and nothing less, just enough to be efficient. The first two steps work in conjunction with each other; spraying and tidying all stubborn areas like tiles, toilets and glass doors. Work clockwise when doing this so that you don’t forget where you started. The reason we spray and soak at the beginning is to allow for heavy build-up to be easily broken down, and secondly to allow any bacteria to be killed (a disinfectant requires between 5-10 minutes of dwell time to do this). Let the product do the heavy lifting for you. So, the way you make this happen is as follows; remove items that may be in the way of the tough areas (such as a plunger) to allow for maximum coverage with the product. Then, spray all of these surfaces and be generous! So here, we’ll circle around the bathroom and pick up garbage and recycling, put things where they belong and some quick organization. For this step, you don’t need cleaning products, you just need your garbage bag/recycling bag. At this time, if you feel certain parts of your bathroom need a bit of reorganizing as you go along, this is the time to do it. Now that the bathroom is neat and the grimy areas have had a chance to soak, it’s time to actually clean it. This is where the bulk of the cleaning takes place. For the third step, we’re going to tackle the scrubbing, dusting, and cleaning. To prepare for the third step, keep a dry microfiber cloth over your shoulder so that you can ‘buff’ surfaces dry as well as keeping an all-purpose cleaner close by. High and low dusting is the first thing you’re going to do. The important thing to know about dusting is that dust falls from the top to the bottom, so you want to start at the top and work your way down. That’s why we start with the high dusting. Prepare your high and low dusting tool now, by placing a dampened microfiber cloth over the end of a mop pole. Working again in a clockwise direction so not to miss any parts of the bathroom. Being sure to hit all corners of the room as well as any door frames, vents, and light fixtures. When this is done, work your way down dusting any baseboards using the same tool. Now that your high and low dusting is done, take 2 cloths and your bottle of all-purpose cleaner and moisten your cloth so that it’s damp. Start scanning (top to bottom) and seek out any fingerprints, marks on the wall, or points of contact that need dusting and polishing. As you get to counter tops, remove all items on the surface, spray and wipe the area, and then replace all items back on the counter as you found them. Wipe the items as you replace them. Now, you’ll hit the toilet. Assuming you’ve sprayed the whole toilet, put some gloves on and take your paper towel and wipe the tank, flusher, lid, rim, base, and area behind the toilet with a paper towel. Then take your toilet bowl brush and scrub your way around the bowl until you get to the chute, which also needs to be scrubbed. For your mirror, spray it with glass cleaner and take a clean microfiber cloth and wipe using an “s” pattern from top to bottom, and buff out any streaks as needed. Move along to your window sill, use a cloth to wipe the frame and sill of the window, and you can spot clean any fingerprints if you wish. You’ve made it to the simple and final step! This step is short. Simply clean your points of contact (knobs, handles, etc.). Empty your garbage and get the latest floor cleaning equipment and supplies to clean the floors. Use a microfiber cloth as you exit. Obviously, some bathrooms at your facility may be very large making wiping floors with a cloth less than ideal. The conventional method of using a mop simply spreads the bacteria around instead of properly removing the bacteria from the floor. Get the cleanest bathroom floor possible with Bortek’s HammerHead 450RS. The 450RS is perfectly suited for these larger bathrooms or locker room type settings. Check out the video below for a brief demo. Once the floors clean, your bathroom should be spotless and ready for use! You can find the HammerHead 450RS and the rest of Bortek’s line of Cleaning Supplies by logging in or creating your own account through Customer Link! An account on Customer Link gives you access to easily browse and order any of Bortek’s products online for one-stop shopping! *Maintenance is the key. Once your bathroom is clean, stay on top of it. Cleaning the bathroom weekly or even twice a week will keep you and your employees happy.